How do we use Ambition to align sales and marketing KPIs on our own business team? Glad you asked. The Ambition Business Team has been using Ambition since the latter part of 2014. We have a range of team members on it, including C-Level Executives, Account Executives, SDRs and Marketing personnel — anyone who engages in daily revenue-generating activities. Here’s how we use Ambition to drive KPIs within our own team. We track a variety of metrics via Ambition, with each role having a unique set of KPIs factoring into their Ambition Score. Our SDRs are charges with cold calling and emailing prospects, then setting up a demo with one of our Account Executives. The main two activities that generate our apex objective (demo scheduled) are emails and calls. Logging a call or email in Salesforce triggers a small boost to an SDR’s daily Ambition Score. Logging a new demo scheduled triggers a much bigger Ambition Score boost, as it is the prime objective for an SDR. As you can see, they included our top revenue-generating activity (outbound calls), a mid-funnel objective (demos completed) and apex objective (deals closed). Those KPIs are weighted in ascending order. Logging a new closed deal triggers the most dramatic boost to Ambition Score, while logging an outbound call triggers the smallest boost. As Director of Marketing, lead generation and nurturing is my total focus. For that reason, my three KPIs that go into my Ambition Score are all objective-based, with Inbound Demo requested weighted highest, since that’s the most preferred action a new inbound could take. 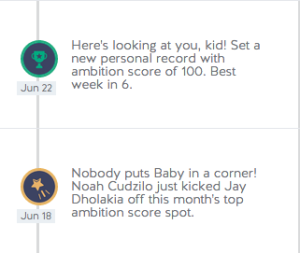 We sync our marketing automation platform, Pardot, with Salesforce, so a new inbound lead automatically triggers an update to my Ambition Score. Every user on Ambition has an Ambition Anthem. Users select their personal Ambition Anthems from YouTube, which will then play whenever they hit a major milestone (ex. a 100 Ambition Score for the day) on our TV in the Ambition Sales Lab. We’ve also used the Ambition Scores to determine which sales reps got to attend major conferences such as Dreamforce and the AA-ISP Leadership Summit. Beyond that, we also get notifications when we’re reaching personal bests and overtaking a peer in a given metric. Hope 1st place was fun while it lasted, Jay. As a small team, it’s been difficult and/or unnecessary to utilize some of our product’s core features, like competitions and reporting. (Click here to read the Harvard Business Review’s profile of how Clayton Homes used those features). With that said, we’ve gotten a ton of mileage out of Ambition. As a Marketing team member, I love being able to go toe-to-toe with Sales and see how I’m stacking up against them, in terms of hitting my benchmarks. With sales and marketing, it can be hard to get excited about the little things — making a cold call, updating prospect info into Salesforce and so forth. Ambition has changed that within our team, and it’s doing so in many others around the world.